PHOENIX, AZ (September 17, 2012). – Treasurer of the United States Rosie Rios has been added as a speaker for The Adelante Movement: Tour Phoenix, a live forum that brings together Latina leaders from around the country to inspire them to take action to improve their economic lives. Presented by Coca-Cola, the forum is hosted by Nely Galán, founder of The Adelante Movement for Latina economic empowerment, in association with he Hispanic Women’s Corporation (HWC), and features a roster of powerful and inspirational speakers headlined by Nobel Peace Prize Laureate Rigoberta Menchú Tum. The forum takes place during the Hispanic Women’s Corporation Annual Conference on Thursday, October 11 from 12:30-4:30 pm at The Sheraton Downtown Phoenix. Phoenix was chosen after Adelante received hundreds of emails from Arizona women requesting the tour come to their city. The Adelante Movement forum attendees must be registered for the Hispanic Women’s Corporation Conference at www.hispanicwomen.org. For hotel/airline discounts, log on to www.starwoodmeeting.com/book/hispanicwomescorporation. 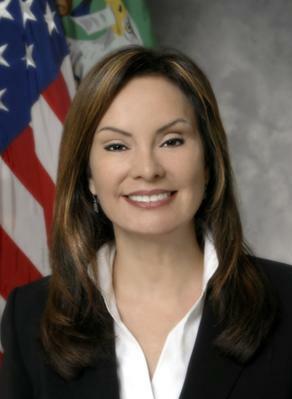 Prior to her confirmation as Treasurer, Rios worked at MacFarlane Partners, where she was Managing Director of Investments. Working with MacFarlane Partners’ development and global capital partners, Rios played a central role in facilitating equity transactions for large mixed-use development projects in major urban areas. In November of 2008, Rios took a leave of absence from MacFarlane Partners to serve on the Treasury/Federal Reserve Transition Team and is a graduate of Harvard University. The Adelante Movement is a grassroots movement that aims to unite and empower Latinas economically through a digital platform and a national tour of live forums that will partner with leading non-profit organizations to connect Latinas and their families to jobs, start-up funding, franchise and entrepreneurial opportunities, and mentorship—with the goal of creating a private sector solution to bringing economic stability to Latino families via moms, many of the heads of households and are the emerging economic market in the country. The idea is to empower this elite group of Latina leaders and members of The Adelante Movement, to create economic opportunities and prosperity in their communities. Join the movement: www.theadelantemovement.com.